MFAW Summer 2009 Goddard graduates in front of the Eliot Pratt Library on campus. We're holding up our bound theses. 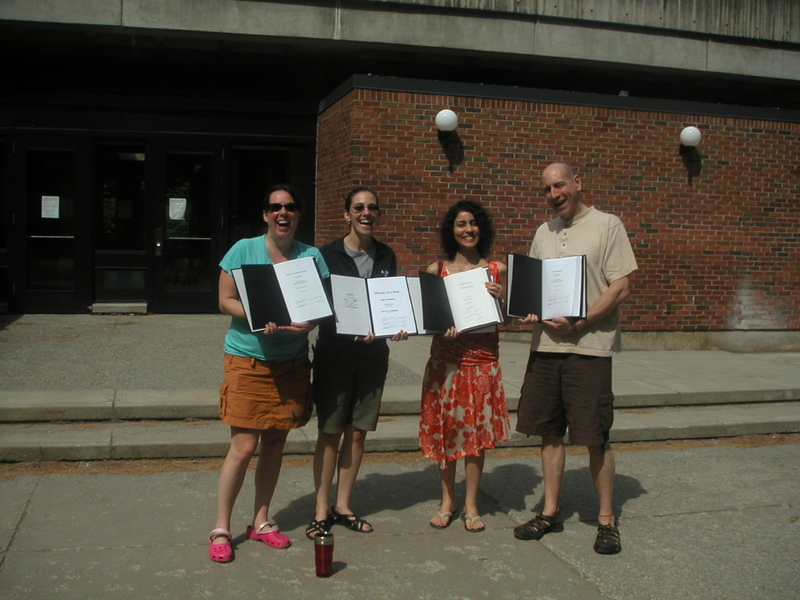 Left to right, me, Amy Tranchida, Maria Chaudhuri, and Christian Thiede. I hold an MFA in Creative Writing from Goddard College in Plainfield, Vermont, and alumni are encouraged to send copies of their books so they can be placed in the permanent collection at the Eliot Pratt Library on campus. I sent them a copy of Skeletons in the Swimmin’ Hole: Tales from Haunted Disney World. I just received a nice e-mail thanking me and noting it would be placed in the library with a nameplate. I’m just proud my work will be part of the school and accessible to other students. I know many of you who read my blog/newsletter are Goddard graduates, so when you have a book published, keep in mind that Goddard would welcome a copy. Posted on March 22, 2011, in News, Skeletons in the Swimmin' Hole -- Tales from Haunted Disney World and tagged Eliot Pratt Library, Goddard College, Plainfield VT. Bookmark the permalink. Leave a comment.